We are officially in Summer mode so salad it is! I would gladly eat salads of hummus and couscous all week long but I think it wouldn’t be long before I’d get some complaints at home about a lack of meat! 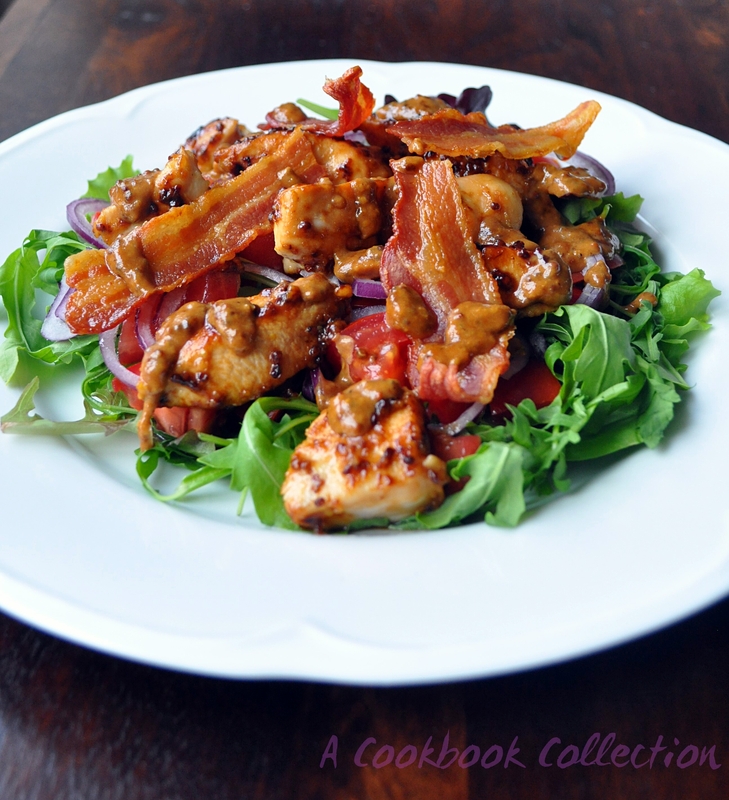 While my favourite chicken salad is the Smoked Chicken Caesar Salad, himself loves this one. It is very simple to throw together for a midweek meal. I have specified that the chicken should be marinated for a bit but if you are stuck for time feel free to push on and cook immediately. The wholegrain mustard and honey caramalises while you are cooking the chicken so that will make sure there is plenty of flavour anyway. The remaining marinade is cooked with creme fraiche to make a rich creamy dressing. For me, this is plenty on it’s own but if you have some old bread you could add croutons as per the Caesar Salad recipe or serve with some Roast Potatoes, just leave out the balsamic vinegar or it will clash with the dressing in the salad. Next time I make this I will add some avocado for extra freshness. A pic before adding the bacon and dressing, just because I think it looks pretty! Place the diced chicken breasts in a bowl. In another bowl whisk together the mustard, honey, olive oil and garlic. Pour this over the chicken. Season with a little salt and pepper and mix well together so that the chicken is well coated. Cover with clingfilm and allow to marinade in the fridge for 30 minutes to an hour. 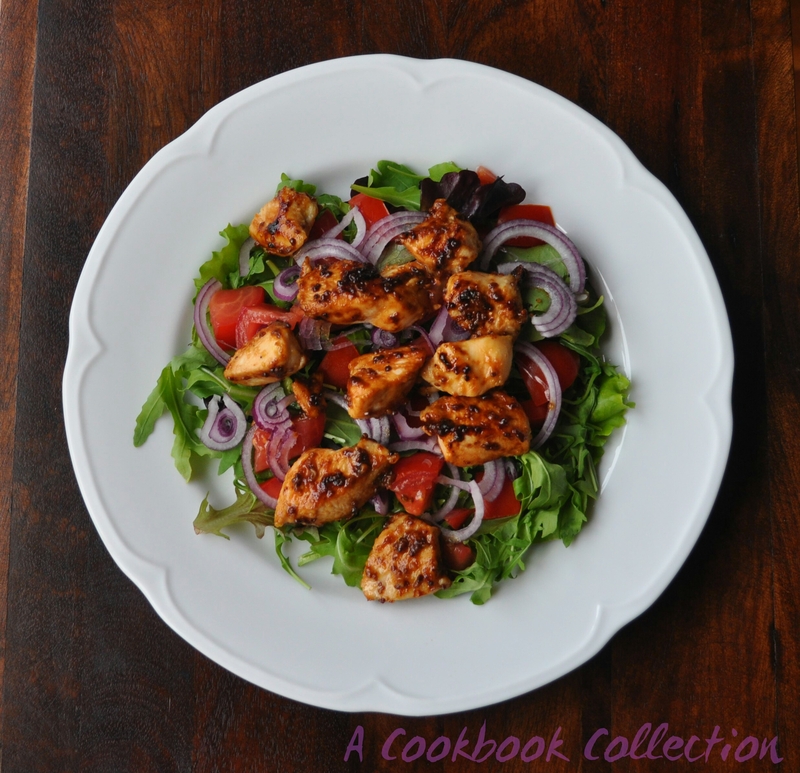 When ready to make the salad, remove the chicken from the fridge and heat a large non stick frying pan over a medium-high heat. Grill the bacon until it is nice and crispy. Remove the chicken from the marinade but hold on to the marinade, you will be using this to make the dressing later. Fry the chicken until it is just cooked through. 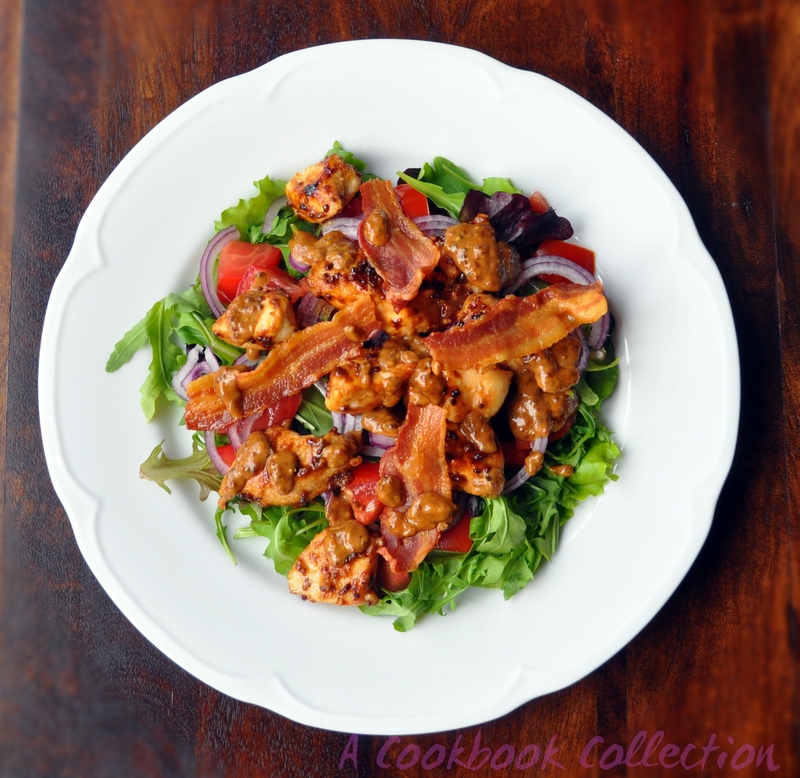 While the chicken and bacon are cooking, prepare the salad. Arrange some leaves on 2 plates. Dice the tomatoes and very finely slice the red onion. Sprinkle these over the lettuce. When the chicken is cooked divide this between the 2 plates with the crispy bacon. Keep the pan that you cooked the chicken in on a high heat and add just a splash of white wine to deglaze the pan. When the alcohol has burned off, reduce the heat slightly and add the marinade that is left in the bowl and the creme fraiche. Stir continuously and allow it to start gently bubbling. Pour this dressing over the salad. Thanks Nicola! It’s funny how we get set in our ways. A flatmate of mine years ago thought I was so weird because I never cooked potatoes. She had them with everything, even pasta ? Oh noooo!!! I’m not a big lover of potatoes at all, my husband can’t understand it, he loves them….and I hate washing the pots after them too! That’s a seriously good-looking salad. I think you’ve peaked, and it’s only June. That is one beautiful looking salad.